How Does the Philippines Currently Stand in Terms of Equity in Education? Educational systems should aspire for two things: quality and equity. Although the Philippines has not participated recently in international exams, there are existing measures by which one can still compare the Philippines against other countries. 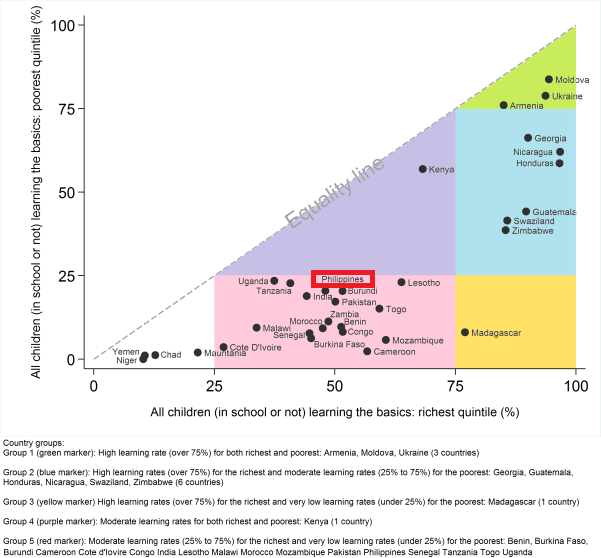 And in a study that examines educational systems in 67 low and lower-middle income countries, the overall picture is not encouraging. Philippine basic education seems to suffer in both quality and equity, and these challenges, as stated numerous times in this blog, exist at the primary level of basic education. 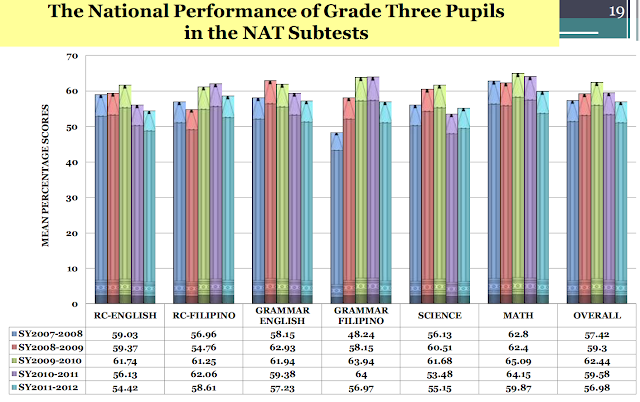 The above graph shows the learning outcomes as measured by national achievement tests in Grade 6 mathematics. Only about a quarter of poor children who are enrolled in schools in the Philippines achieve a passing mark in this assessment. On the other hand, about half of children from wealthy families pass this exam. Indeed, there is a huge gap between the poor and rich, but equally troubling is the overall poor performance of both poor and rich children. In elementary school mathematics, it is crystal clear that the Philippine basic education suffers in both quality and equity. The above graph shows another trend that is not seen in most other countries. 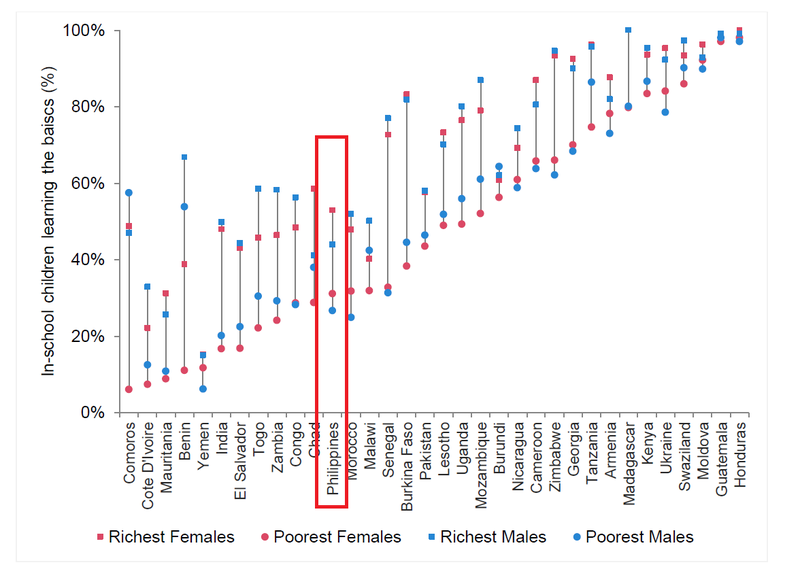 Females perform better than males in both rich and poor quintiles. What is likewise evident in this graph is the fact that the gap between poor and rich children correlates with lower quality of education. Thus, although quality and equity may be regarded as two separate standards - these two may actually be related. The above graph now includes children who are not currently in school. 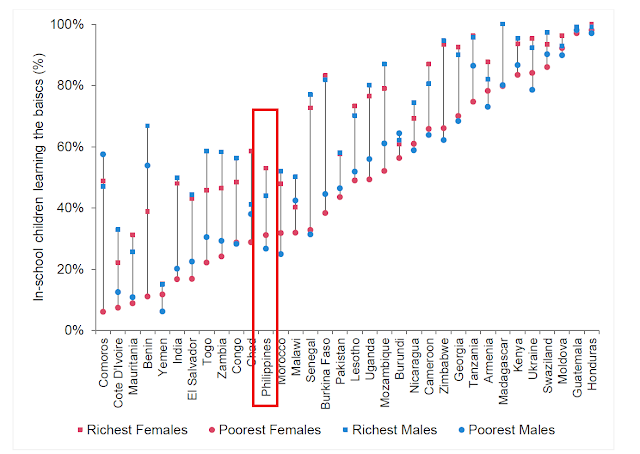 Where the Philippines stands in this graph is not really different from the previous graph. 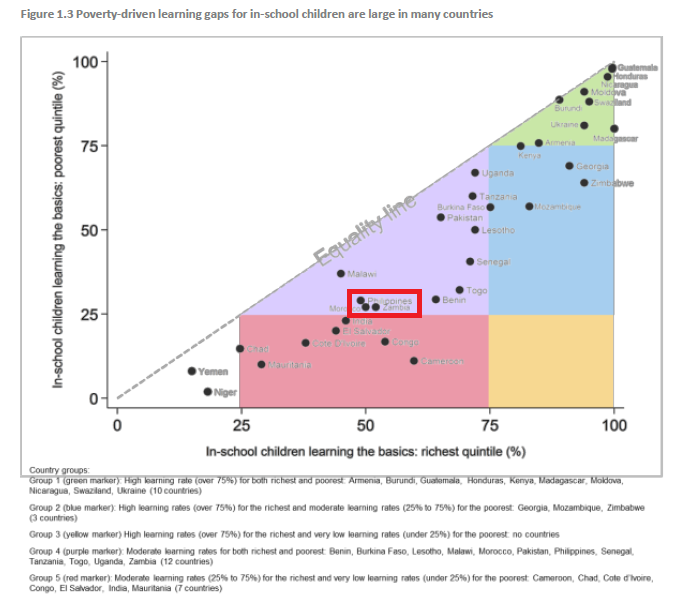 Unlike Madagascar, where schools obviously make a significant impact on poor children, the situation in the Philippines does not really show a difference between children who attend or not attend schools. 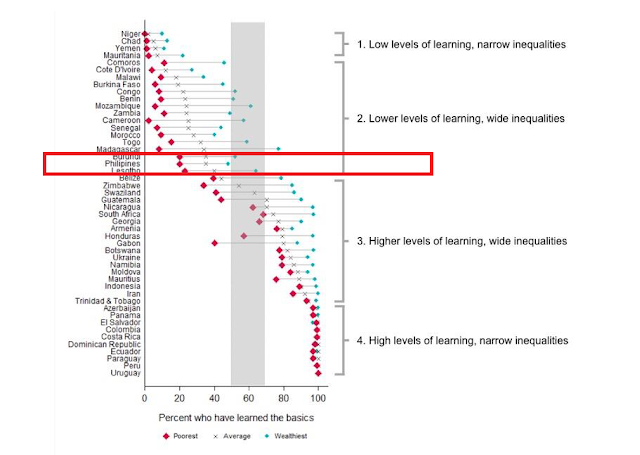 Finally, the above graph shows the trend that high levels of learning can be present with narrow inequalities. Sadly, the Philippines, in this set of low and lower-middle income countries, belongs to the group that has low level of learning and wide inequalities. 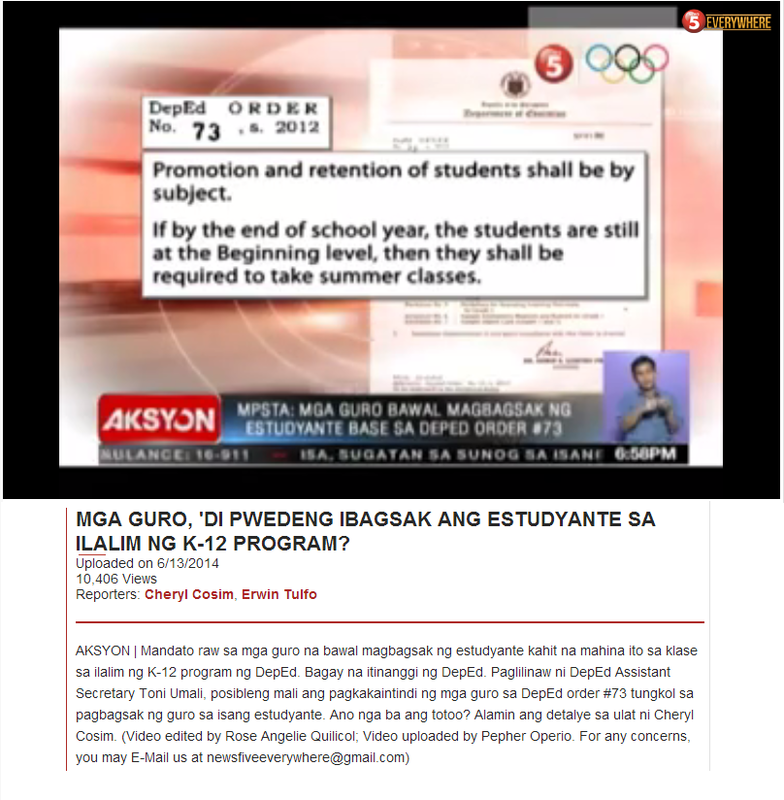 Philippine basic education currently fails in both quality and equity.